Always make sure that your content involves and engages your audience. On the packaging or disk label clearly explain the benefits of inserting the CD-ROM. Talk to professionals for ideas on how to design an interactive interface and enhance your use of the power of CD-ROM. We manage all aspects of CD ROM production including the creation of interactive menus, interfaces and content including Flash & Acrobat. We can design the artwork for the label and packaging, and liaise with the pressing plant to help ensure there are no expensive surprises when the CD-ROM arrive. CD-ROM are universally accepted, modern, highly portable between Mac and PC and are a valued item when received and packaged in a targeted way. Links can be made to websites to promote or launch them and the distributed content, if installed on the recipients computer, can be easily updated online when required. Interactive CD ROMs can contain the entire range of digital media including interactive programs, video, Adobe Acrobat PDF's, Flash or Director . 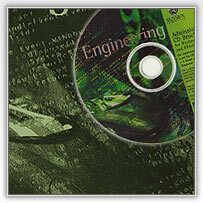 We also produce interactive business card style CD-ROM. Fresh can help or create the CD ROM contents. After all the client is an expert in their own field, not in this. If you have and idea of what you want to happen when a CD-ROM is loaded but are not clear on how to make it happen, then we can help. As with all our services we focus on quality and originality to produce effective media for all types of CD ROM distribution. See the Case Studies section for examples of CR-Rom and their use. It is common practice to turn paper documents into electronic copies in Acrobat PDF format. (Ask us about our scanning service). We can design and build menus and create attractive interactive PDF's for replication on self running CD-ROM. We can also programme Adobe Acrobat pdf's including forms and calculations. A CD-ROM the size and shape of a standard business card can hold surprising amounts of data and video etc. and have that extra impact when presented. Business Card CR DOM are very portable, slipping into a jacket pocket with ease yet can contain 120 Megabytes and more of content.